Daisen Backpackers is surrounded by nature and is not centrally located. For travelers who prefer a more central and convenient location, we recommend an accommodation facility in downtown Yonago City. Note that Tottori Sand Dunes is approximately 90km east of Daisen Backpackers and takes 1.5 hours to travel by car. lzumo Grand Shrine is approximately 90km west of Daisen Backpackers and takes 1.5 hours via San-In Expressway by car. If you use a GPS navigation system to come to Daisen Backpackers, enter our address, not our phone number, or just follow the above directions. 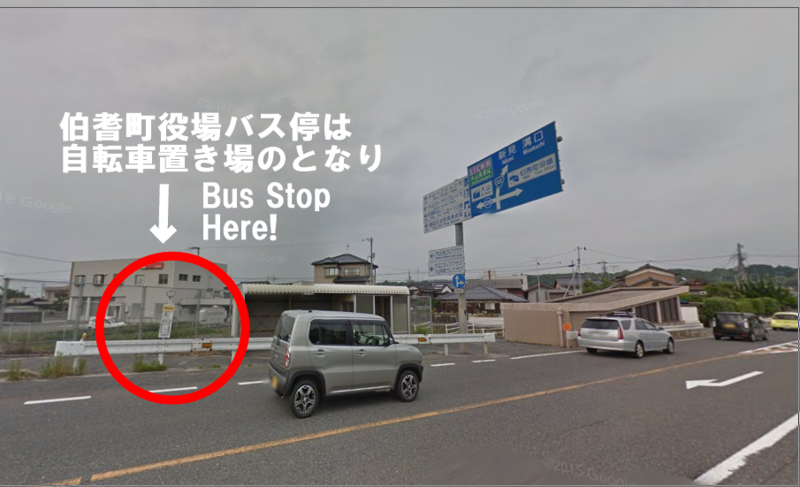 Our nearest bus stop for Highway Buses is “Daisen Parking”. All the buses from Namba (O-CAT), Umeda (Osaka), Sannomiya (Kobe), and Kyoto stop here. From Daisen Parking, please use a taxi. The bus driver can arrange for a taxi to pick you up when you reach Daisen Parking. The bus driver will inform you of the details when you are traveling on the bus. If you use a public train, JR (Japan Railways), our nearest station is Kishimoto Station of JR Hakubi Line. take JR San-In Line and transfer to JR Hakubi Line at Hoki-Daisen Station. Kishimoto Station is the next stop. take JR San-In Line and transfer to JR Hakubi Line at Yonago Station. Kishimoto Station is the third station from there. Daisen Loop Bus is a sightseeing route bus that takes travelers to various tourist destinations around Mt. Daisen. If you buy a 1-day (or 2-day) Loop Bus ticket, you can use it also to get on local buses from JR Yonago Station to Daisenji Temple which makes it worth your money. For this season, Daisen Loop Bus mainly operates on Saturdays, Sundays and Japanese public holidays between Saturday 29th April ad Sunday 5th November 2017. The Loop Bus operates every day during the following period: Golden Week (from late April to 5th May), summer holiday period, and foliage season in fall. 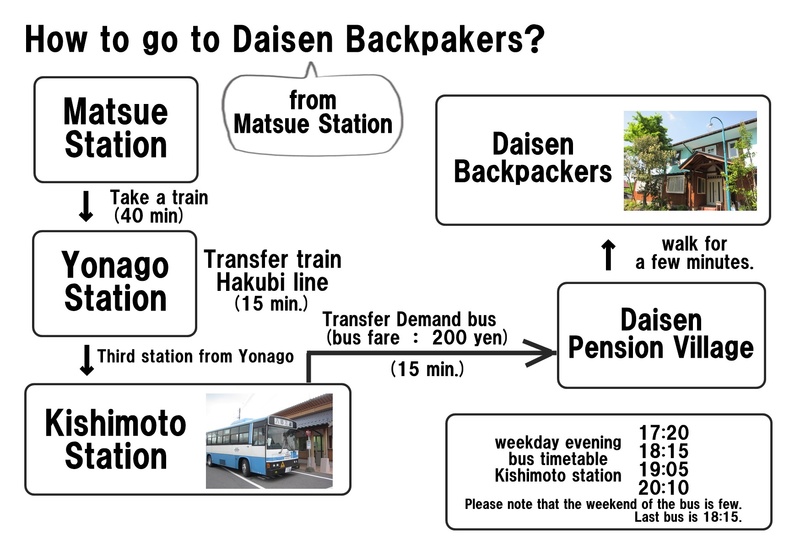 The nearest bus stop from Daisen Backpackers is “Daisen Garden Place” which is only a 15-minute leisurely walk to our facility.